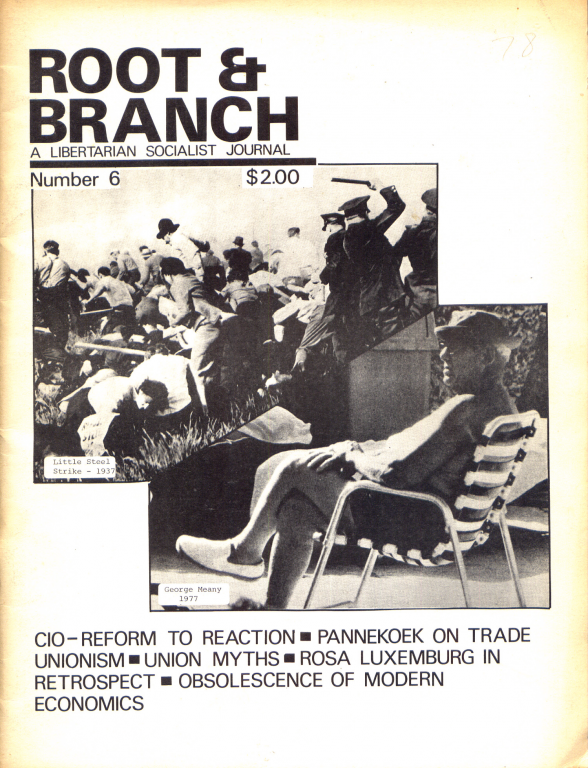 Partial archive of the 1970s libertarian socialist publication out of the U.S.
Good to see this now available on libcom as I only now have left a cannibalised copy of Issue 7 and a copy of their Pamphlet No6 on Portugal though I'm sure I/we had more of their material at the time. Does anyone know if any members of Root and Branch continued on into other groups after it's dissolution? Seems like the members that I'm familiar with (Jeremy Brecher, Paul Mattick Jr., Stanley Aronowitz) retreated into academia and sort of left their council communist politics behind (actually I don't really know what Paul Mattick Jr's current politics are). Well, the omly former R&Ber I can speak of with any confidence is Peter Rachleff. I believe he moved to Minnesota sometime in the late 1970s or early 1980s. During the 1980s I think he wrote about and tried to publicize as much as possible the Hormel strike in Austin, Minnesota. This is also referred to as the P-9 strike or P-9 struggle, after the UFCW local there. More recently he was (still is?) a history professor at Macalester, a private liberal arts college in St. Paul, MN. I know he served as a mentor to at least a few students who went on to be a core of the Twin Cities IWW branch. Many of the 'Macalester kids', as I sometimes refer to them, went on to be organizers in the Starbucks, Jimmy Johns and Chicago-Lake Liquors campaigns, among others. During the protests in Wisconsin during 2011, he drafted something that was included in the 'general strike packet' that the education committee of the South Central Federation of Labor was pushing. I've seen him speak at a number of events here, such as the IWW's Work Peoples College and a Labor Notes conference. I think currently, most of his political activity is focused on the East Side Freedom Library, a leftist archive/library in St. Paul he helped found a few years ago. At the Work People's College in 2012, I asked Peter Rachleff about his involvement in Root & Branch. He said he was the youngest member and went on to say since they published their book as a mass market paperback, it didn't get distributed very far and most copies got pulped. Which is unfortunate, since it has so many excellent articles. I believe that several years back Brecher was part of then Rep. Sanders staff. This was well before Bernie became a household name, and I don't know if he is currently associated with the Senator or worked on the Presidential campaign. ETA-- this suggests he resigned over Sanders' vote to authorize the Serbian bombing operation. Hello, I am looking for the 9th issue of Root & Branch. If anyone can provide a pdf of the issue, I would be obliged.